It sits hidden from view at the edge of the Dog Creek Valley. With its massive size, broad wraparound porch and architectural details that harkens to the craftsmanship of days gone by, it is surely one of Claremore’s finest homes. Yet most people in town don’t even know it exists. 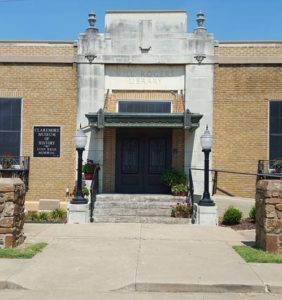 But to Taylor (Tate) Faulkner and the rest of the Faulkners of Claremore, it is the hard-won centerpiece of their family, and home to five generation of David Faulkners…his father, brother, son and grandson. The original David Faulkner, who died before the home came into the family, was born in the Sequoyah District of Indian Territory to Frank Faulkner and Aursakie Potts. His mother, a full-blooded Cherokee Indian, instilled in David McNair Faulkner a love and respect for the Cherokee people that was to influence his entire life. At the beginning of the Civil War, Faulkner enlisted in the Stand Watie Confederate Cherokee Volunteers, a regiment known for its lightning-like attacks and its tenacity, made up entirely of men of Cherokee descent. The regiment performed scouting missions deep within Union territory, harassing wagon trains and busting food trains that supplied Union troops. With the end of the war, the young soldier hung up his gun, moved back to Sequoyah County, and in 1867 married a young woman named Rachel Adair. As Faulkner became a successful businessman and cattle rancher, the family grew with the addition of nine children. In 1875, a year after Tate Faulkner’s father, David Jesse Faulkner was born; they headed east, establishing a new homestead. The ranch is now home to Tulsa Mohawk Park. Never forgetting his roots, Faulkner served in the Cherokee National Senate for many years, going to Washington, D. C., as a delegate in 1897. In 1903 he was elected assistant chief of the Cherokee Nation…the last to hold the post before Oklahoma became a state. Two years later, the family pulled up stakes and moved to a ranch nine miles north of Claremore. David McNair Faulkner died in 1914. Before David NcNair died, he saw his son, David Jesse marry Jennie Foreman, who lived right down the road from the Faulkner ranch. The young couple made their first home in Tahlequah, where like his father before him, David was active in Cherokee government. Several years later, they returned to Rogers County to start their own ranch half a mile from the home of Jennie’s mother. In 1913, David Faulkner was elected Rogers County commissioner, an office he held two years. The couple had eight children, including David Tamblyn, and Taylor Adair, who was born in 1915. With hard work from the entire family, the Faulkner Ranch became successful, prompting Faulkner to branch into other businesses, including a partnership to form a new bank in the growing little town of Claremore. Economic pitfalls, however, are not limited to modern times, and the bank soon went under. For several years, every penny the family earned went toward paying that debt. Faulkner’s character showed in his time of hardship just as it showed in his time of prosperity. In 1925, David Jesse Faulkner was elected sheriff of Rogers County and stayed in that position 10 years. Still reeling from their financial woes, the family suffered another setback when their ranch home burned to the ground. Their family heirlooms, including old family photographs, were destroyed in the fire. After the embers of their home cooled, the family rented a house near Foyil, and two years after that, moved to Claremore. In 1935 they pulled together to buy the home that would be passed down through the generations. After the Flippins moved in the early 1930’s, they offered to sell the house to the Faulkners. The price, however, seemed out of reach. But destiny proved persistant, and in 1935 a relative of the Flippins came from Arkansas to once again offer the house to the Faulkners, who had not yet recovered fully from their financial problems. The sons and daughters of David Jesse Faulkner rallied together to help their father buy the home. After growing up, the Faulkner boys followed their father’s and grandfather’s lead, becoming successful ranchers and public servants. After a 20-year career with the Oklahoma Highway Patrol, David Tamblyn Faulkner became sheriff of Tulsa County, serving 23 years. Tate served in the Army during World War II. In 1945, he was elected Rogers County commissioner, holding the office 34 years…15 two-year terms and one four-year term. He saw each term come and go from the house that he and his family struggled so hard to buy all those years before. Faulkner’s sister, Cooleela, also lives nearby. Taylor and his wife, June, have two daughters, Jan and Lisa, and one son. The son is the fourth generation David Faulkner to live in the old family home. Owners of Claremore Abstract, he and his wife, the former Mary Horne, have two sons, Taylor and David…the fifth generation David to live in the house. From the window of Taylor and June’s new house, which sits on a portion of the original 67 acres, you can see the big brick home. It sits nestled among the trees, looking out over the Dog Creek Valley, a monument to the successes, struggles and perseverance of the Faulkner family.